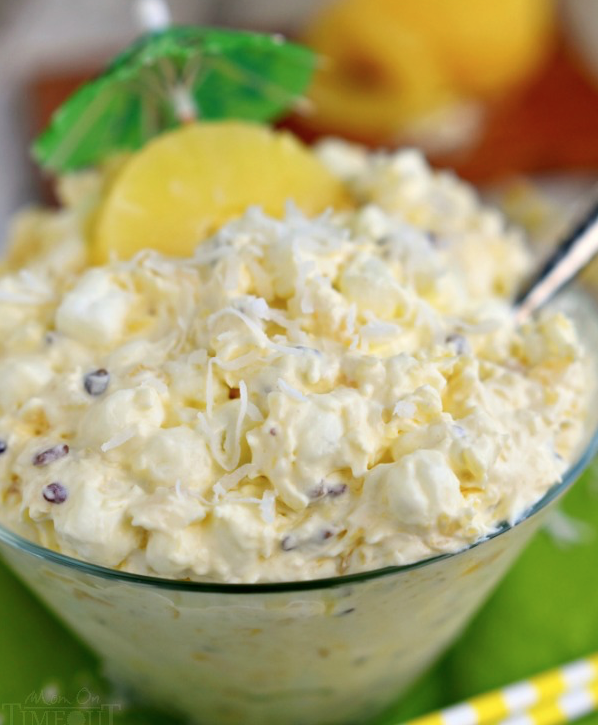 If you love the sweet tropical taste of Piña Colada with pineapple, coconut, and rum, then this retro fruit salad made with the popular drink flavors could be one of the yummiest desserts you’ve had! Sweet, creamy and light with tropical fruit chunks, marshmallows, and nuts, it’s a delicious chilled dessert to enjoy for the summer months! Yummy! An easy throw-in recipe in 5 minutes (including a little rum!) before chilling and then it’s ready to be enjoyed. It’s that easy. And thanks to Trish at Mom On Timeout for recreating an old classic with mouthwatering tropical taste! Make for a small or large crowd. Either way, it will be ALL GONE. Or simply enjoy a big bowl alone at home, with thoughts of the ocean and sand between your toes. It’s worth every delicious bite! Sweet, creamy and light with tropical fruit chunks, marshmallows and nuts! Want Another Great Recipe? Now Watch How To Make Piña Colada Cake!